Born in 1959 in the North Island of New Zealand, I spent the first nine years of my life on a 6000 acre sheep and cattle station which is where my love for nature and animals began. After moving from the station, the rest of my childhood was spent in Raglan, a small costal town on the west coast of New Zealand. These environments allowed me to become an avid collector of natural forms. From the drying seedpods found in creek beds to the eroded, polished, and or skeletal forms washed up along the rugged west coast - the land and sea soon cluttered my room and became the inspiration behind my creative expression. It was in Raglan during my teen years that I was introduced to carving. By watching a local Maori carve exquisite traditional works in wood, I spent many hours observing, talking to and absorbing his skills. This is best described as my “unofficial apprenticeship” of sorts. In 1980, I travelled to Australia on a working holiday and found myself in Bendigo doing a Bachelor in Ceramics. It was during my third year while producing figurative forms that my sculpting career began. A few years after graduating - my work, methods and materials developed and expanded from ceramics to using steel, copper, bronze, aluminium, cement, stone and more recently resin. Throughout my career a major influence of mine has been Henry Moore. Not only was he the greatest sculptor of his time, but like me, he shared a passion of form derived from nature. It was through his inspirations and works that I was drawn and introduced to scale. This led me to develop larger sculptural works of my own for public spaces and private developers. Strengthened by 30 years experience as a full time professional artist/sculptor, I spend many hours of my day designing and making unique sculptures for a growing clientele. With this, I have also forged relationships and developed a vast network comprising of skilled people with whom I liaise with to help me bring a job to a successful completion. More often than not, my public works have me making sculptures requiring the support of structural engineers, foundries and construction workers to ensure public safety of all works. Often these sculptures are also site specific and require community consultation and negotiation with a number of people ranging from clients, councils, builders and engineers. Having produced both small and large scale works for private and public commissions around the world, how I practice and deliver my work is paramount in maintaining my reputation as a sculptor/ artist. 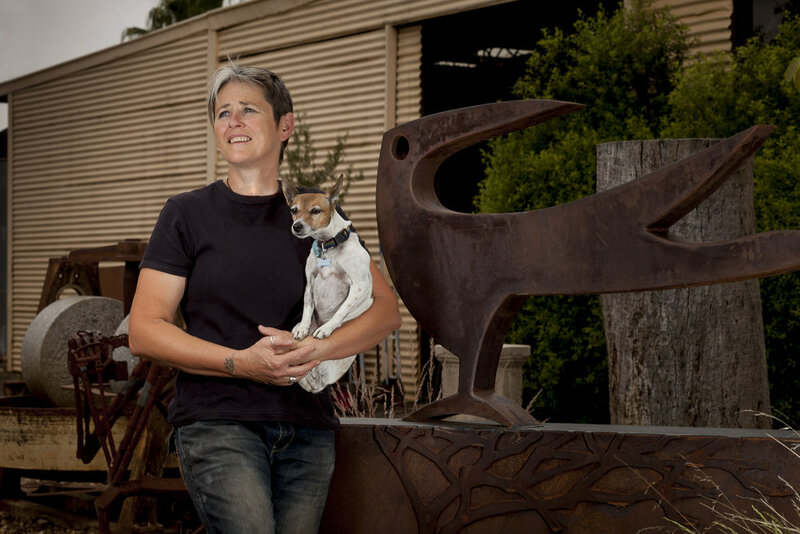 At present, you can find me at my gallery located at the Bendigo Pottery in Epsom, which is a great place to view many of my small domestic size sculptures. As organic forms continue to inspire my works, I find my sculptures and art will always be changing and developing. I am often in my gallery working on a number of projects and so I welcome everyone to come and visit.